This is the digital Media Kit that contains both information about and materials for Cardio Dance Club by Jen deHaan. Click any of the links below to jump to the section containing information you need.  Cardio Dance Club was created by Jen deHaan as a way to offer a highly-customized dance fitness format to a gym community in a way that best met their needs. The format first launched in California, and was further developed and refined (and taught using a new name) after returning to Vancouver Island. The idea for the class was to fuse the best features of the various dance fitness formats Jen taught and participated in as a student. The class was later launched under a new name in Coombs, B.C., and then in Nanaimo. 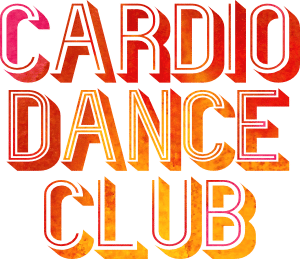 Classes are presently taught in Errington (multiple classes), Qualicum Beach, and Nanaimo B.C..
Cardio Dance Club offers simple choreography that students can follow along to, set to the latest music from the radio and throwback favorites. 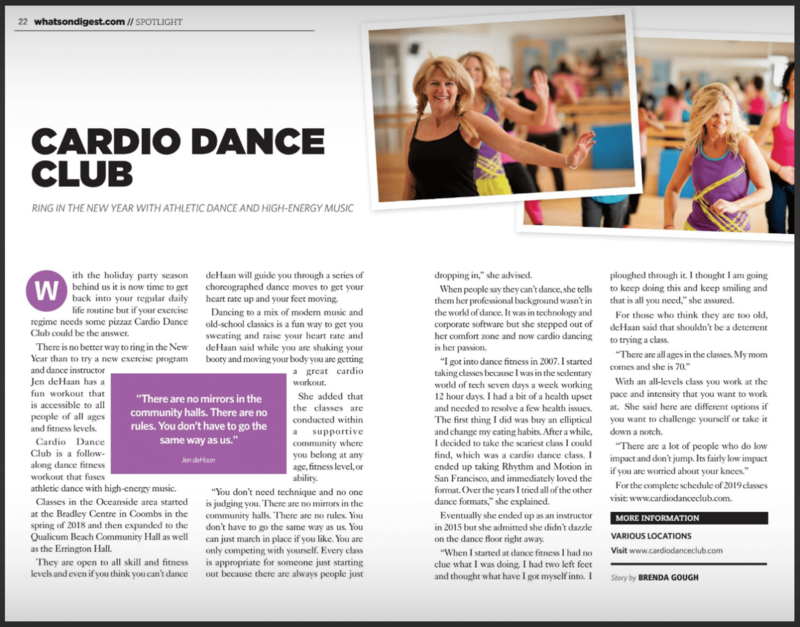 Cardio Dance Club is an easy, follow-along dance fitness workout that fuses athletic dance and fun, high-energy music. It is an all-levels class where you work at the pace and intensity that you want and need to work at. Music includes today’s hits from the radio, throwback favourites, and a few international beats. But most importantly, Cardio Dance Club is about the FITNESS and the COMMUNITY. You will focus on various intensities of cardio fitness, and also complete toning songs as well to work on your form and strength. All the while within a supportive community where you belong at any age, fitness level, or ability. This is an all-levels class where you work at the pace and intensity that you want and need to work at. Be supported, be seen, be heard. Find more information at CardioDanceClub.com/DanceClub. Consistent clear cueing. Verbal and visual cues are both offered to tell students what moves are coming next (“pre-cues”). Fitness, safety and motivational cues (verbal). Students will learn how to move safely to avoid injury, and also how and when to work harder to improve fitness levels. Recognizable high-energy and fun music. Current hits from the radio, and throwback favorites are incorporated into the playlist. Consistent, follow-along pre-choreographed songs. Students have an opportunity to learn the moves from week to week. Taught at multiple times per week, with a focus on community building around the class. This has resulted, for example, in retaining class size over slow summer months. Experienced instructor. Multiple years of experience (teaching 7-12 classes per week when in California) at a variety of demographics (age, experience, cultural/language, etc). 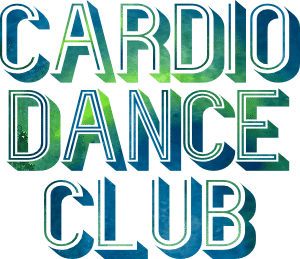 Download the Cardio Dance Club logos individually (below, right-click to download), or as a batch of all sizes and variations HERE. All files have transparent background. Please contact me if you require a different size. Also available as white with transparent background HERE. Classes in Errington Hall (Monday and Thursdays), offered through ACRA. I was interviewed for an article in What’s On Digest magazine for the Parksville / Qualicum Beach region (January 2019) and noted on the cover too! Click the image to see the full (readable) size. You can find a sample press release on this page (2017 press release). A press release can be written and customized for the launch of any new class. New classes and events are submitted to local community calendars and newspaper listings. Events are created on Facebook to support the class, in addition to class announcements in local groups that support such posts. I use my personal Facebook account to engage with students, in addition to a newsletter and social media. My newsletter includes the new song release for that week’s classes, and sometimes a playlist for the week (although I usually encourage song requests instead). I encourage students to connect with me during classes, which only fosters community and students to return to class the next week. I ask that this is supported at the locations where I teach, as it is an important part of what this format offers students (for example, an important way to support some student’s mental health – being “seen”, or just play the music they want to hear and dance to). Fitness classes and demos at local schools as part of their fitness events or after-school activities. This has included volunteering at Errington Elementary School (Errington, B.C. ), and San Miguel Elementary school (Sunnyvale, California). 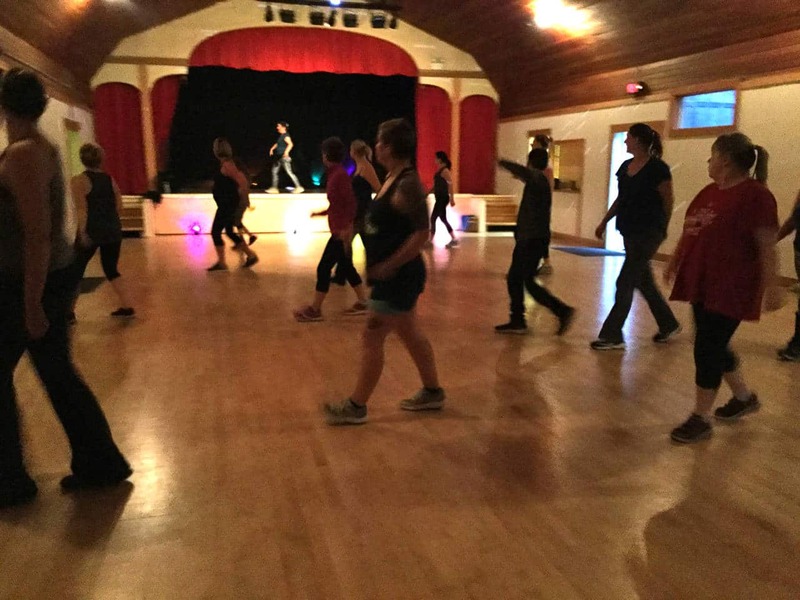 Held a Cardio Dance Club class and discussion session for instructors in School District 69 in Qualicum Beach for their Pro-D day activities. I volunteered at a fitness convention in San Jose, California (The Fit Expo) assisting a dance fitness program. I led a dance fitness class series for children at Palo Alto Children’s Library that was open/free to the community to promote wellness. Assisting Arrowsmith Community Recreation Association at local events for the community. I also volunteer with several environmental and wellness organizations, including Arrowsmith Naturalists.